Just remember, kids, you’re not paranoid if they’re really out to get you…or your movie dollars. 135 min. Universal Pictures. Director: Tony Gilroy. Cast: Jeremy Renner, Rachel Weisz, Edward Norton, Stacy Keach, Dennis Boutsikaris, Oscar Isaac, Zeljko Ivanek, Scott Glenn, Donna Murphy, Corey Stoll, Albert Finney, David Strathairn, Joan Allen. Meet the new Bourne, same as the old Bourne. That’s the impression left by The Bourne Legacy, a would-be franchise refresher in which Jeremy Renner grabs the baton from Matt Damon. The new movie is directed and co-written by Tony Gilroy (Michael Clayton), who has screenwriting credit on all three of the previous films starring Matt Damon as Jason Bourne. And it can be said for Gilroy and The Bourne Legacy that they do a decent job of convincing us that, for over two hours, we’re watching something other than a plate of reheated leftovers. But we’re not. Everything in The Bourne Legacy, you’ve seen before, and quite recently, whether it be recycled from the Bourne trilogy or even Joe Wright’s Hanna, fer gosh sakes. What is this movie about? A chemically-enhanced super solider—let’s call him Aaron Cross (Renner)—discovers his masters have turned on him: he’s the spy that went out in the cold (literally: he spends the first leg of the picture in Alaska). Cross tracks down Dr. Marta Shearing (Rachel Weisz), the only surviving doctor who used to maintain him; now worse than expendable, she, too, has been targeted for a government cleanup. Without his “chems,” Cross has begun to degrade, so he grabs the twice-traumatized Marta by the arm and starts running around the world so they can evade capture and secure survival. Meanwhile, an army of character actors, led by alpha character actor Edward Norton, barks at monitors and each other in dark control rooms and, occasionally, private offices. Universal Pictures and Gilroy don’t take any chances here: tin rooftops will be dashed upon, blue filters will be applied liberally to the photography, and man and woman will speak breathlessly to, and sexually imprint on, each other, as they bond on the lam. The familiar action includes a few swift bone-crunchings of outmatched security men and a couple of dodge-and-duck third-person shooter sequences. When the house-of-cards story threatens to fall apart but good, Gilroy lets a dog off a leash (another super soldier with “diminished empathy,” a Bourne “without the emotional noise”) to justify a big-scale chase climax. Renner and Weisz are as solid as one might respectively expect, but Gilroy doesn’t succeed in making us care much about them or saying anything more pointed about the state of American covert affairs than “We are morally indefensible and absolutely necessary,” instead expending acres of talk on military doublespeak and technobabble about viral genomic targeting. As Scott Glenn’s CIA director confesses early on, “I’ve kind of lost my perspective on what’s possible.” Just remember, kids, you’re not paranoid if they’re really out to get you…or your movie dollars. 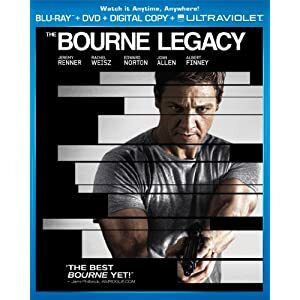 Universal treats its franchise baby right with a Blu-ray + DVD + Digital Copy + Ultraviolet combo pack of The Bourne Legacy. The A/V is outstanding here, with picture quality that maximizes the source material. Especially impressive are the crisply rendered contrast and the impeccable detail, though natural grain and rich color also help to sell this clean, well-resolved image. The lossless DTS-HD Master Audio 7.1 surround mix is even better, guaranteed to rock your soundsystem with force and precision in the action scenes, natural ambience in the quieter moments, and clarity of dialogue throughout. Both LFE and rear channels prove unusually active here, making for a deep-digging and immersive aural experience. Bonus features kick off with a solidly informative and chatty commentary by director/co-writer Tony Gilroy, co-writer Dan Gilroy, editor John Gilroy, cinematographer Robert Elswit, production designer John Thompson and second unit director Dan Bradley. Three "Deleted Scenes" (6:48, HD) come with optional commentary by the Gilroys and Elswit: "Pennsylvania Highway," "NRAG Research Room" and "Washington, D.C."
"Re-Bourne" (6:11, HD) deals with the approach to sorta rebooting, sorta sequelizing without Jason Bourne in the picture. Blu-exclusive "Enter Aaron Cross" (7:11, HD) focuses on the new character, largely from the perspective of the actor who plays him, Jeremy Renner. Blu-exclusive "Legacy on Location" featurette "Crossing Continents" (8:22, HD) examines the far-flung locales that served as this film's locations. Blu-exclusive "Man vs. Wolf" (4:36, HD) looks at the various methods used to shoot the wolf sequence (and freak Renner out), while Blu-exclusive "Wolf Sequence Test" (1:39, HD) is an animated storyboard. Blu-exclusive "Moving Targets" (6:11, HD) deals with the parallel (then convergent) storylines of Aaron and Rachel Weisz's Marta. Lastly, "Capturing Chaos: The Motorbike Chase" (7:49, HD) elucidates the making of the climactic action sequence. All site content © 2000-2019 Peter Canavese. Page generated at 04/18/2019 02:38:12AM.